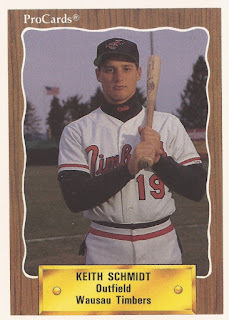 Keith Schmidt helped get the Kane County Cougars started, at least in the home run department, according to David Malamut's book on the team. Schmidt hit the club's first-ever home run after the team's move from Wausau, Wisc., to Geneva, Ill., in 1991, Malamut wrote, launching the two-run shot in the sixth inning of the April 12 game against South Bend. Later, he smacked two home runs in a single game. Schmidt hit those home runs in his third season as a pro. He went on to play in three more. He never made AA. Schmidt's career began in 1989, taken by the Orioles in the second round of the draft out of Burton High School in Texas. Schmidt started at rookie Bluefield. He hit .227 over 55 games. He then played 1990 between Bluefield and single-A Wausau. He hit .278 at Bluefield, but .153 at Wausau. He again split 1991 between Bluefield and the Midwest League. In 64 games at Kane County, he hit those three home runs but still hit .193. Going into 1992, Schmidt tried to work on his performance at the plate, attending a hitting school conducted by Wade Boggs. Schmidt's average that year back at Kane County improved to .256. Schmidt's tenure with the Orioles ended in 1993 after a short 18-game stint at single-A Albany. He signed on with the Brewers for another short stint, 15 games, at single-A Beloit. Schmidt's pro career then ended in 1994, playing nine games at single-A Macon for the Braves. Schmidt has since returned home to Texas. He's listed in 2016 as an instructor at Prime 9 Baseball Academy outside of Houston.